Scenic Hudson is working to help the Hudson Valley develop long range plans for global climate change in general and for sea level rise along the estuary in particular. We do this both as part of our mission as and a direct stakeholder, since we own over 1,000 acres of protected lands along the river’s edge. Our goal is to work toward a future that balances and reduces risks to people, property and nature and holds the promise of secure, thriving riverfront communities within a vibrant, healthy ecosystem. Our work on climate change can be divided broadly into two categories: mitigation and adaptation. 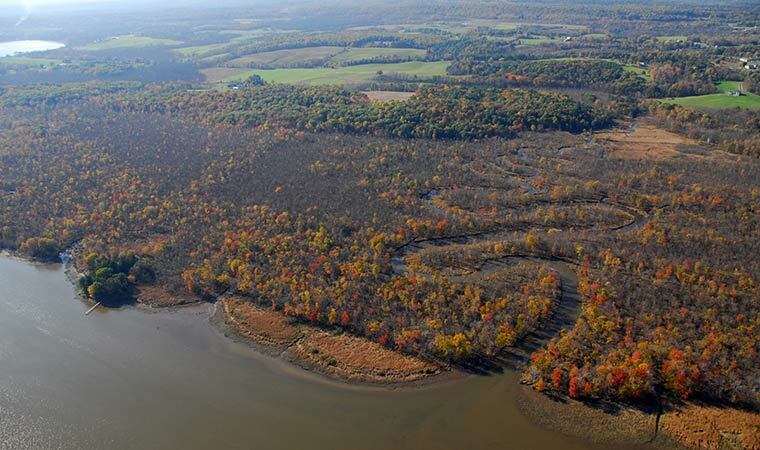 Land conservation efforts in the Hudson Valley by Scenic Hudson and its partners have provided permanent protection to thousands of acres forests, which play an important role in sequestering carbon. Because of their unique ability to lock up large amounts of carbon in their wood, trees can slow the increase of carbon dioxide that is trapping heat in the Earth's atmosphere. Revitalizing Hudson Riverfronts—Scenic Hudson's 100-page illustrated guide to responsible waterfront planning details many conservation and development strategies designed to create healthy, prosperous communities. By embracing the guide's principles for promoting smart growth and preventing sprawl, planners can create walkable, low-carbon communities that can help slow the pace of climate change. Scenic Hudson's public policy team works with Gov. Andrew Cuomo and New York State lawmakers to promote more progressive energy and land use policies that will help reduce our state's carbon footprint. We’re fighting for ambitious implementation of policies like Reforming the Energy Vision, the state’s Smart Growth law, and increasing the amount of renewable energy in our state's energy system so that New York continues to lead the way toward a low carbon future. There are many actions we can take to reduce the climate impact of our daily lives: such as driving a hybrid or electric automobile, taking public transportion when possible and installing solar panels. Educating residents of the Hudson Valley about what they can do and why it's so important is another important component of Scenic Hudson's climate mitigation strategy. Our Conservation Science and Education staff give frequent talks to community meetings and school groups. Our "Climate Change in the Hudson Valley" booklet, downloadable in English and Spanish, is distributed throughout the region. Through multiple innovative initiatives, Scenic Hudson scientists are generating data and defining new conservation priorities specifically targeted at preparing the Hudson Valley and its landscape for the changing climate. We’re developing strategies for guiding conservation investments toward the most vulnerable habitats and places to safeguard the future integrity of the valley. As detailed in this peer-reviewed journal article (pdf, 7MB) and this summary report (pdf, 4.5MB), we’ve created cutting-edge models to project how sea level rise will affect the Hudson’s tidal wetland habitats and allow us to prioritize sites where valuable marshlands are going to be in the future. Our results can be explored in this interactive map. With funding from the Doris Duke Charitable Foundation, we’re building a climate resilience conservation plan for the entire Hudson Valley region. Scenic Hudson provides tools and direct support to planning boards, municipal governments and other groups concerned about helping the Hudson Valley adapt to coming climate change. In addition to the detailed guidance provided by our Revitalizing Hudson Riverfronts publication, we've developed the Scenic Hudson Sea Level Rise Mapper—a free, online tool that helps communities visualize the impact of rising water levels at specific locations along the river and begin to plan for the "new normal." Our Conservation Science staff has worked directly with officials and citizens in several communities to convene waterfront resilience task forces. With our support, Kingston (Ulster), Piermont (Rockland) and Catskill (Greene) have been able to accurately assess their risks, understand their options and begin planning for safe, secure and vibrant waterfronts in the future. Scenic Hudson works closely with the New York State Department of State and the New York State Department of Environmental Conservation on multiple climate-based initiatives. We also advocate for specific legislation like the Community Risk and Resilience Act that helps guide our officials towards making smart investments in climate resilient infrastructure and overall community preparedness. Thanks in part to our policy team's efforts, New York State is making considerable investments in gathering data and developing tools that will be freely available to help government, nonprofits and the private sector make more informed decisions as they develop adaptation strategies. Scenic Hudson is committed to leading the valley toward a more resilient future through innovative new approaches to park design and land stewardship. Scenic Hudson's Long Dock Park features landscapes and structures designed to withstand periodic flooding. Our Esopus Meadows Preserve features two flood-resilient pavilions and sustainably stabilized shoreline. Explore our new interactive guide to preserving Hudson River tidal wetlands in the face of sea level rise.